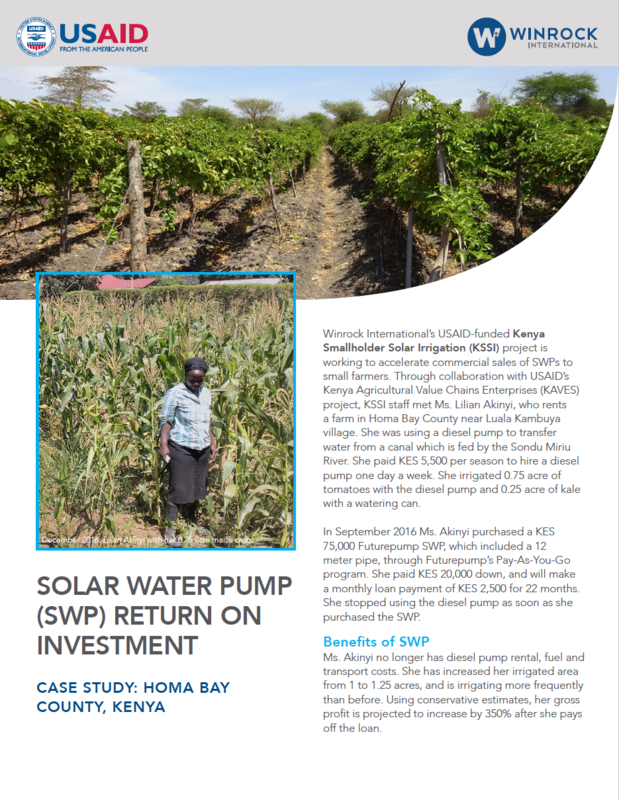 Winrock International’s USAID-funded Kenya Smallholder Solar Irrigation (KSSI) project is working to accelerate commercial sales of SWPs to small farmers. Through collaboration with USAID’s Kenya Agricultural Value Chains Enterprises (KAVES) project, KSSI staff met Ms. Lilian Akinyi, who rents a farm in Homa Bay County near Luala Kambuya village. She was using a diesel pump to transfer water from a canal which is fed by the Sondu Miriu River. She paid KES 5,500 per season to hire a diesel pump one day a week. She irrigated 0.75 acre of tomatoes with the diesel pump and 0.25 acre of kale with a watering can.